Nothing affects employee morale more insidiously than persistent workplace negativity. It saps the energy of your organization and diverts critical attention from work and performance. Negativity can occur in the attitude, outlook, and talk of one department member, or in a crescendo of voices responding to a workplace decision or event. As a manager or human resources professional, you are closely in touch with employees throughout the company. You receive employee complaints, do exit interviews with employees who leave, and know the reputation of your organization in your community. You watch the discussions on employee intranets, manage the appraisal and 360-degree feedback process, and coach managers in appropriate staff treatment. This information helps you learn to identify the symptoms of negativity before its morale-busting consequences damage your workplace. It will also assist you in preventing and curtailing workplace negativity. Negativity is an increasing problem in the workplace, according to Gary S. Topchik, the author of Managing Workplace Negativity. He states, in Management Review, that negativity is often the result of a loss of confidence, control, or community. Knowing what people are negative about is the first step in solving the problem. 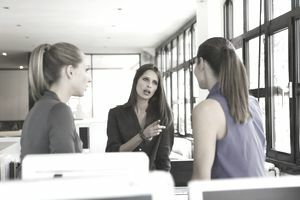 When rumblings and negativity are surfacing in your organization, talking with employees will help you understand the exact problems and the degree to which the problems are impacting your workplace. You will want to identify the exact employee groups who are experiencing the negativity and the nature of the issues that sparked their unhappiness. Perhaps the organization made a decision that adversely affected staff. Perhaps the executive manager held a staff meeting and was perceived to threaten or ignore people asking legitimate questions. Whatever the cause of the workplace negativity, you must address the issues. Or, like a seemingly dormant volcano, they will boil beneath the surface, and periodically bubble up and overflow to cause fresh damage. Remember that the best way to combat workplace negativity is to keep it from occurring in the first place. Provide opportunities for people to make decisions about and control and/or influence their own job. The single most frequent cause of workplace negativity is traceable to a manager or the organization making a decision about a person’s work without their input. Almost any decision that excludes the input of the person doing the work is perceived as negative. Treat people as adults with fairness and consistency. Develop and publicize workplace policies and procedures that organize work effectively. Apply them consistently. Treat your employees as if they are trustworthy and worthy of your respect—because they are. Start from a position of trust when you hire a new employee. Verify their performance, truthfulness, and contribution over time to confirm your original position. Do not start from a position of believing that people must earn your trust. That positioning ensures that negativity will take over in your workplace. Employees have radar machines and they are constantly scoping out their work environment. If you don't trust them they will know you don't. Do not create rules for all employees when just a few people are violating the norms. You want to minimize the number of rules directing the behavior of adult people at work. Treat people as adults and they will usually live up to your expectations, and their own expectations. Help people feel included—each person wants to have the same information as quickly as everyone else. Provide the context for decisions, and communicate effectively and constantly. You cannot over-communicate if your desire is to reduce negativity and gain the confidence and support from your employees. Provide appropriate leadership and a strategic framework, including mission, vision, values, and goals. People want to feel as if they are part of something bigger than themselves. If they understand the direction, and their part in making the desired outcomes happen, they can contribute more. People make better decisions for your business when you empower them with the information they need to make decisions that strategically align with your overall direction.